Family-run Bromsgrove firm Broad Street DIY celebrated its 40th anniversary in January. The shop was first opened by Tony and Linda Warren on January 8, 1979. Originally located on Broad Street, in Sidemoor, the business has grown from humble beginnings and today three generations of the Warren family work there. While Tony remains “the Boss”, his son Paul was appointed managing director in 2002. The firm is also managed by Paul’s brother Brian, Paul’s wife Hayley, and his sister Lisa. Paul’s son Liam represents the third generation. A turning point came in 2001 when the shop moved to its current Worcester Road location. Larger premises gave room for a wider range of products and an outside yard allowed for greater expansion into landscaping and building materials. A kitchen and bathroom showroom opened in 2009. 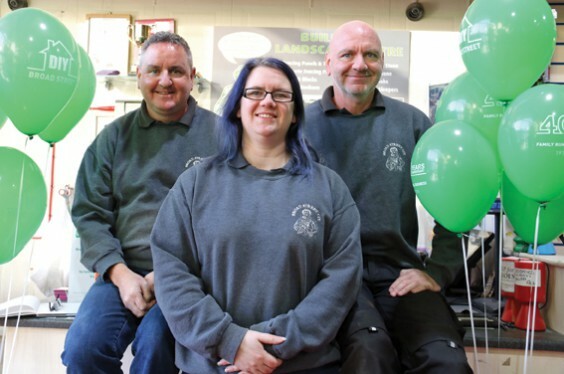 As part of the anniversary celebrations the shop was decorated with hundreds of green balloons, 40 customers received a free goody bag, and there were special offers including 40 per cent off key cutting. A visitors’ book was also available for customers to leave comments. Paul Warren said: “Over the years Broad Street DIY has experienced some very challenging trading conditions – we have survived three recessions in the past 40 years.